Every once in a while we all create a blog post or other piece of content that we’re pretty happy with and does well with our audience. But in your anxiouness to get it published, have you ever taken a short cut by using a stock image? It’s ok, we all have. 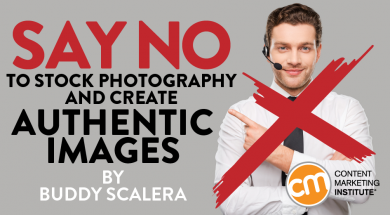 In his article Buddy makes a compelling case for ditching those stock photos and instead be authenticate and essentially, he advises, keep it real. While being a strong proponent of retaining the services of a professional photographer, he says, there’s nothing wrong with using your smartphone to capture that right moment for your content. So tap that listen button for our featured article of the day with Buddy Scalera on this episode of your A Slice a Day. Thanks for including me in A Slice A Day. That was a really fun interview (you are an excellent interviewer). But to hear it cut together like that was magical. You are a true wizard of audio storytelling. The narrative was tight and compelling.